3 hours after a torrential downpour, Cookie found herself to be the only dog, alone, in Pasir Ris dog run. We were so sad that Cookie had no dog to play with. Normally, we don't like to be called mummy and daddy of Cookie. But in this instance, I have to say, Cookie is a daddy's dog. In the dog run, she won't want to play until Vincent is in there with her. Without Vincent, she would just focus on finding him, as you can see from the video below. 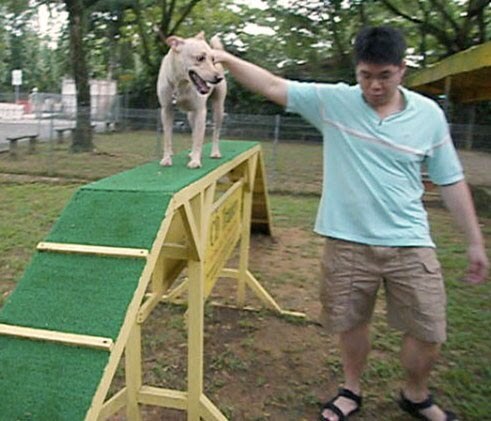 Once Vincent was inside the dog run, Cookie became very happy, excitable and willing to try anything - she didn't mind going up and down the agility ladder course. She had a good workout without having to chase/being chased by any dog.